A couple of weekends ago I had a chance to return to Monte Sirente (2348m), a mountain Edita and I attempted in winter a couple of years ago. 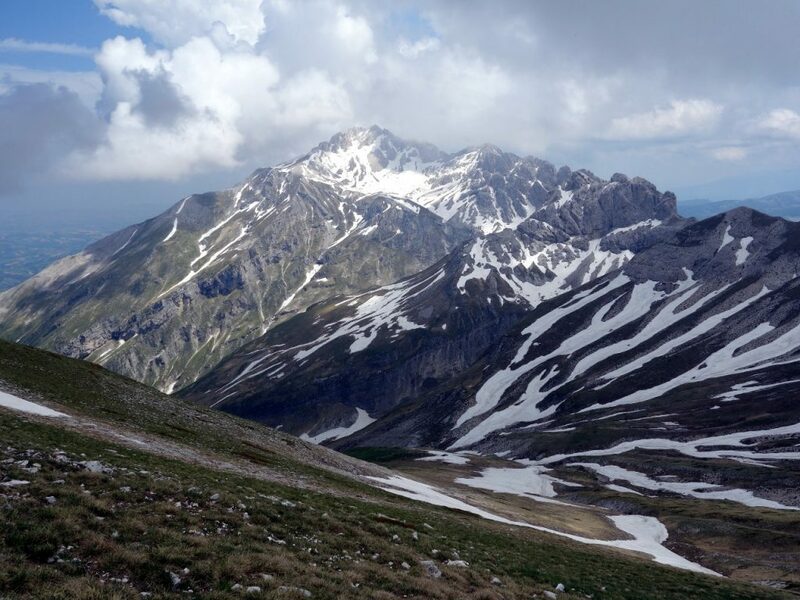 It’s an unusual mountain in the heart of the Central Apennines with two distinct sides. The west side rolls gently over grasslands down to a high altiplano (high altitude plain) the Altopiano delle Rocche, at roughly 1300m. The east side terminates abruptly in cliffs, with one or two narrow gullies providing access to the summit ridge. It was this latter side that we chose for our winter attempt. It was an interesting day out, with a number of climbing and navigational challenges. The snow was knee deep, which made it a tiring ascent. Nobody had been before us, so we had to invent our own trail. Although paint marks on trees enabled us to find a way through the forest, above the tree line we had to improvise, choosing feasible gullies to climb and hillsides to traverse. Towards the top we were overtaken by a pair of friendly Italians who were better equipped than we were. With just our walking axes, we had been stamping footprints in the snow. They raced past us with an ice tool in each hand, and when they reached the summit ridge they threw a rope down to help us. We were grateful, but with hindsight it denied us the summit. Without our footprints to follow, we needed the rope to get back down again. The sky was overcast and our Italian friends had no wish to complete the short walk to the summit, so we had to return down the rope before they left. 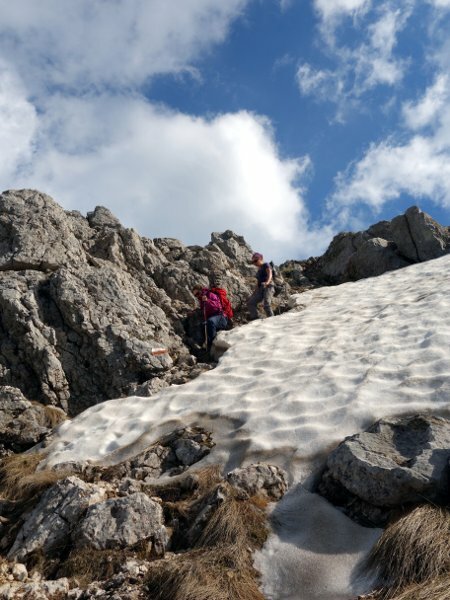 We returned the same summer, and climbed Monte Sirente from the western side, but since then we have wanted to return to the east side and climb through the cliffs when they are free of winter snow. Our chance came earlier this month. The Sirente-Velino range seems to get better weather then the surrounding areas of the Apennines. There can be stormy weather in Gran Sasso, Maiella and Monti Marsicani, while Sirente-Velino remains cloud-free. The forecast wasn’t so good for the Saturday, but on Monte Sirente things looked OK. The occasion was a visit from two of Edita’s Lithuanian relatives, her sister Jolanta and niece Bernadeta, who both now live in London. Neither are regular walkers, but they have both climbed Snowdon via Crib Goch, an airy scramble, and were keen to get out into the hills. We didn’t shy away from providing them with an adventurous route. We were out late in Rome on the Friday, so we made a slow start that morning. By the time we had driven to the Apennines and parked up, it was 11am when we started our walk. It was somewhat easier than our previous ascent, when he had to break trail through thick snow. Then we had spent ages climbing through the forest as we had to stop and search for paint marks on the trees. This time we raced through the forest and reached the treeline after little more than an hour. Above the treeline, we discovered that the trail followed a completely different route from the one we had taken in winter. Back then we ascended a gully parallel to the cliffs, between the cliffs and a rock tower. But now we found that the marked trail turned to the right and kept underneath the rock tower. 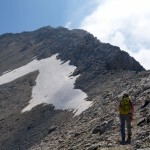 We had traversed snow high above a slope which our marked trail brought us up. In winter this route would probably have been avalanche prone. The marked route also followed scree slopes beneath a second rock tower. During our winter ascent we had kept to the left of this rock tower and found a narrow couloir which led up to the summit ridge. It was early June, but still the mountain wasn’t free of snow. Just below the summit ridge there was a large patch of it blocking the route. We managed to find a steep bank up the left-hand side to gain the ridge. In fact it’s more of a summit plateau than a ridge. We followed a trail between the cliffs, and found it little more than a steep scree slope. Once above the cliffs the terrain was very different: a grassy plateau pebbled with football-sized boulders. The land fell away steeply, but not as immediately to the altiplano 1000m below. We could see the twin peaks of Monte Velino (2486m) in the distance, and below us the curved dragon-back of Serra di Celano (1942m), another mountain we climbed last year, stood sentinel above the lowlands beyond. The final 100m to the summit were an easy walk along the top of the cliffs. 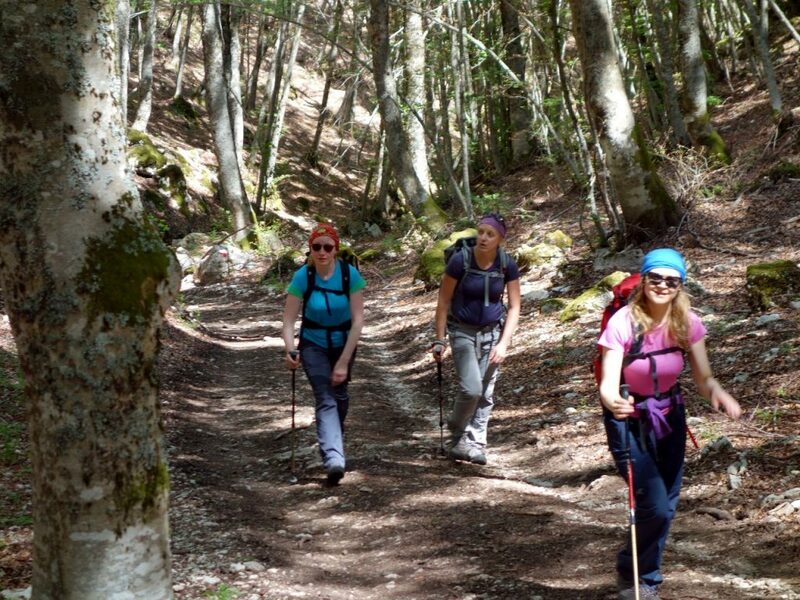 This was our third repeat ascent of an Apennine 2000er after Monte Velino and Monte Amaro. It was busy on top. Edita and I left Jolanta and Bernadeta to sleep up there while we continued along the ridge to bag a second 2000er, Punta Macerola (2258m). This particular ridge descends all the way to the altiplano, and would make for a fantastic ridge walk. The summit of Punta Macerola was much quieter, but we did meet one hiker who had come up the long way, all along the ridge from the village of Rovere, down on the plain. 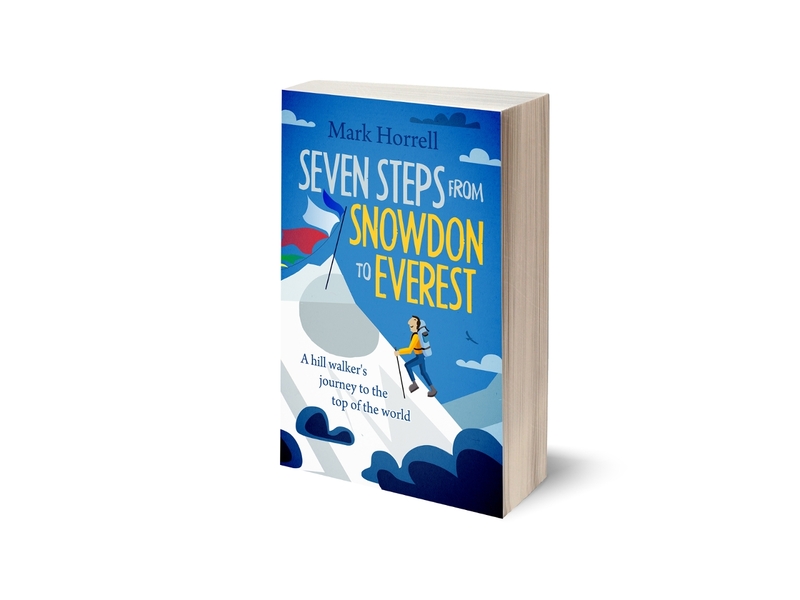 His wife was waiting a little below, having a sandwich, and he wondered how long it would take them to get to the top of Monte Sirente. “Un oretta?” he said (a small hour). We had raced down to this second summit in less than fifteen minutes, and I was sure it wouldn’t take much longer to return (in fact it took us about twenty). “No, solo quindici minuti!” I replied (only fifteen minutes). Sadly, when he relayed this positive news to his wife she didn’t believe me, and we watched them turn and descend. We spent about half an hour over lunch on that peaceful summit, with views for miles. When we got back to Monte Sirente, Jolanta and Bernadeta had just finished discussing how on earth they were going to get down if we didn’t come back. We returned to the point where the trail left the ridge, and left them to take another rest while we nipped up a third 2000er, La Castellina (2277m). This short climb solved a mystery for us, when we were able to look down the narrow couloir we had ascended in winter, and discovered that we could easily have reached the summit that day had we not needed the rope to get back down. 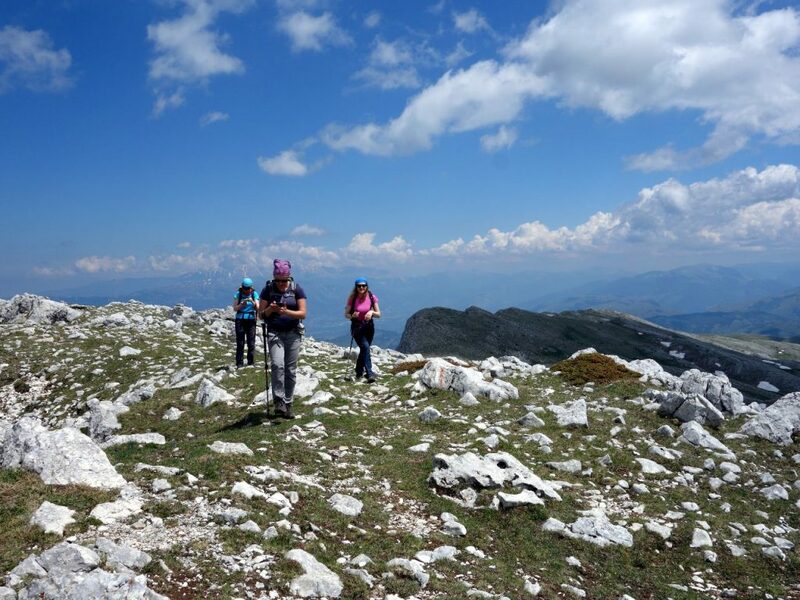 It was a long descent for Jolanta and Bernadeta. Jolanta, normally the quiet and introverted one, was full of confidence and enjoyed every step. By contrast Bernadeta is normally confident and lively in conversation. A musician by profession, the previous evening she had entertained the diners at one of our local restaurants on the Appia Antica with a piano recital. But now she was nervous as we descended the scree, and needed a helping hand of encouragement from Edita. Both of them were tiring as we returned through the forest. We reached the car at 7pm, and they both admitted that our eight-hour day was by far the longest walk they had ever done. They had both done magnificently, and had kept going without complaint. The following day we took them to the Gran Sasso massif, a little further north. 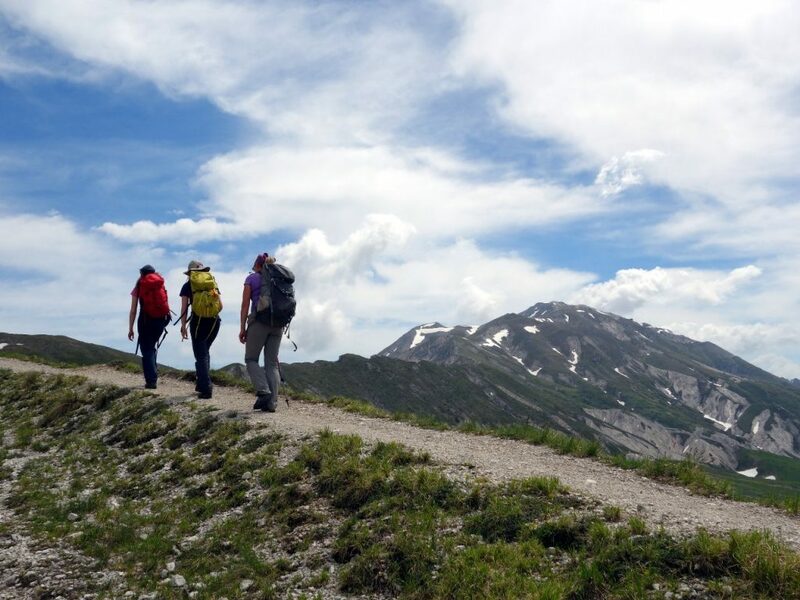 Our original intention had been to take them up Corno Grande, at 2912m the highest mountain in the Apennines, but now Bernadeta was asking if she could drop out altogether, and spend the day relaxing while the rest of us went up a mountain. This wouldn’t do at all, so we promised we would find her something a little easier. As we drove up to the high-altitude plain of Campo Imperatore from our hotel at Fonte Cerreto, we realised that the best way to choose our route would be to show them the mountains, and let them decide. 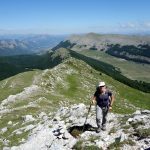 We gave them two options, Monte Bolza, a gentle grassy ridge a little under 2000m that looked across Campo Imperatore to the Cresta Orientale, the 20km multi-peaked ridge that had been the scene of one of our favourite mountain hikes three weeks earlier. The second option was Monte Brancastello (2385m), one of the peaks on the Cresta Orientale that Edita had once climbed with her trekking group a few years ago. It was a little more strenuous than Monte Bolza, but she said it was a much easier walk than our ascent of Monte Sirente the previous day. Not usually one to express a strong opinion, Jolanta was a little more forthright than normal as we approached Monte Bolza. “It looks a bit boring,” she said. We turned around and drove across Campo Imperatore to the start of the route up Monte Brancastello. We drove parallel to the Cresta Orientale, and while Monte Prena and Monte Camicia, our peaks of a few weeks ago, stood out proudly, Monte Brancastello was so indistinct that it was hard to make out any point on the ridge that could be regarded as a separate mountain. As we approached the car park, our eyes couldn’t fail to be drawn to Corno Grande. 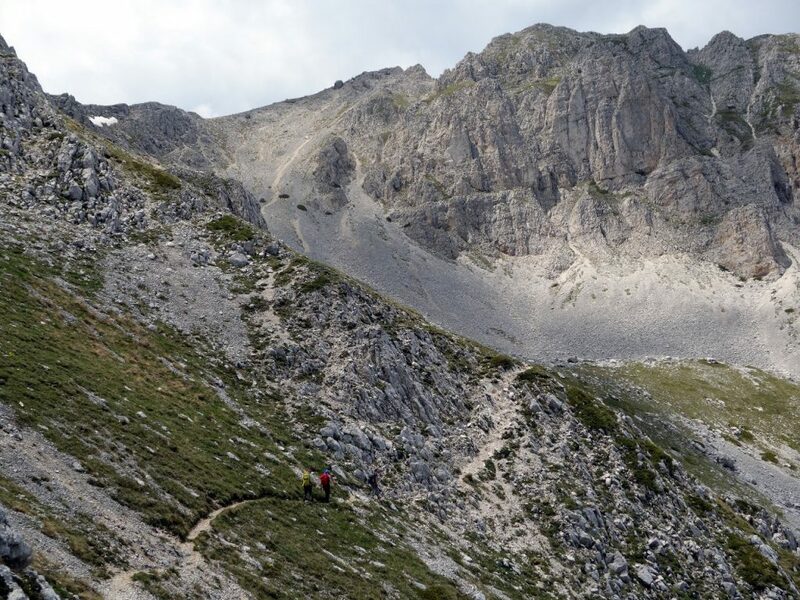 The approach from Campo Imperatore is its most impressive angle, rising up like a cathedral of grey rock, towering hundreds of metres above every other feature in the landscape. It looks unclimbable from that angle, and indeed, its east face is a super-technical rock climb, but this didn’t seem to deter Jolanta. “Can we climb that perhaps,” she said. 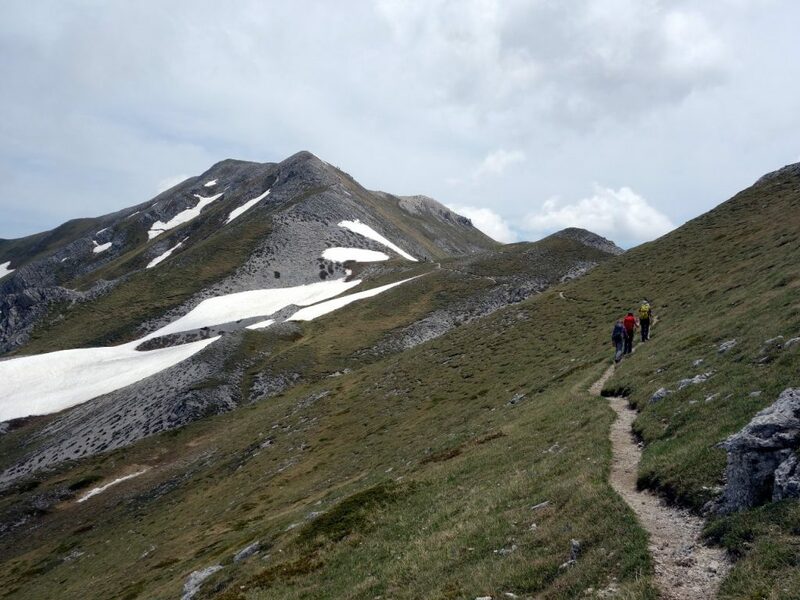 The normal route up Corno Grande actually departs from Campo Imperatore, and is little more than a walk/scramble. After her performance yesterday, we knew Jolanta would be quite capable of climbing it without too much difficulty, but we knew Bernadeta wouldn’t be happy with us if we suddenly changed our plans. The scree slope on the via normale (normal route) is a little more treacherous than the one we descended on Monte Sirente. Happily everyone liked the look of Monte Brancastello when we got to the car park just off the main road. 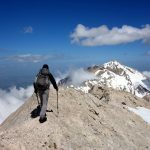 It was a more distinctive mountain from its western side, and we could see that the route climbed gently to the low point on the Cresta Orientale, a col beneath the east face of Corno Grande known as Vado di Corno. It then turned east to head gently along the ridge up to Monte Brancastello’s summit. We hardly noticed our ascent to the col, so gentle it was. The only slightly frustrating thing was that the summit of Corno Grande was now in cloud, and the cloud remained for the rest of the day. This often happens with the Apennines’ highest peak – while the skies can be clear all around, Corno Grande hangs in a crown of grey. The crest of the ridge was narrow, but it followed a good trail. To our left the land fell away suddenly for over a 1000m down to the lowlands, while to the right the vast grassy plateau of Campo Imperatore was just below. We had to look behind to see the rock tower of Corno Grande hanging in cloud, and most of the time our attention was focused in front as the ridge rose in waves. When we climbed Monte Velino for the first time together two years ago, I mistook its second peak Monte Cafornia for the summit. As we approached, Edita spotted a much larger peak along a ridge to our right. “What’s that mountain? I want to climb that one – it’s huge,” she said. “Ah, I think that must be Monte Velino then,” I replied. She found this very funny, and has reminded me about it frequently since, whenever I’ve experienced navigational difficulties. Luckily, on Monte Brancastello I had the chance to get my own back. As we approached one of the many false summits along the ridge, a smaller 2000er, Pizzo San Gabriele (2214m) protruded from the ridge to our left. Unfortunately she was a little quicker than me, and when we crested the false summit and saw the real summit still some distance ahead of us, I was too far behind to laugh at her. There were a few snow patches to cross on the approach to the summit. Now even Edita was having trouble keeping up with Jolanta. Obviously speed climbing runs in the family. Jolanta ran across one of the snow fields to take a photo of the rest of us following along behind. Monte Brancastello had a couple of summits. The main one, with the summit sign on top, was rocky and full of people, so we took our summit photos, then traversed across to the grassy summit, closer to the huge cliff faces on the north side. Here we had our sandwiches as we waited for the clouds to clear off the summit of Monte Prena to our east. This was the mountain Edita and I had ascended three weeks earlier. 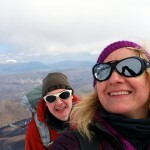 While we were on its summit she had recounted the story of when she climbed Brancastello with her trekking group. She had a sudden craving to climb Monte Prena too, but her trek leader had told her it was much too technical. We were thrilled when the clouds cleared and Monte Prena was revealed. From Brancastello it’s an extravagant fortress of rock with no obvious route up. We discussed the ridge between the two peaks, and wondered how many more 2000ers lay along it. There were one or two rocky pinnacles along the way that looked difficult. After a pleasant hour on the summit we left long after the other walking groups had gone back down. For the sake of completeness, Edita and I raced up Pizzo San Gabriele as the others continued to descend. The Lithuanian conquest of the Apennines ended a short while later. 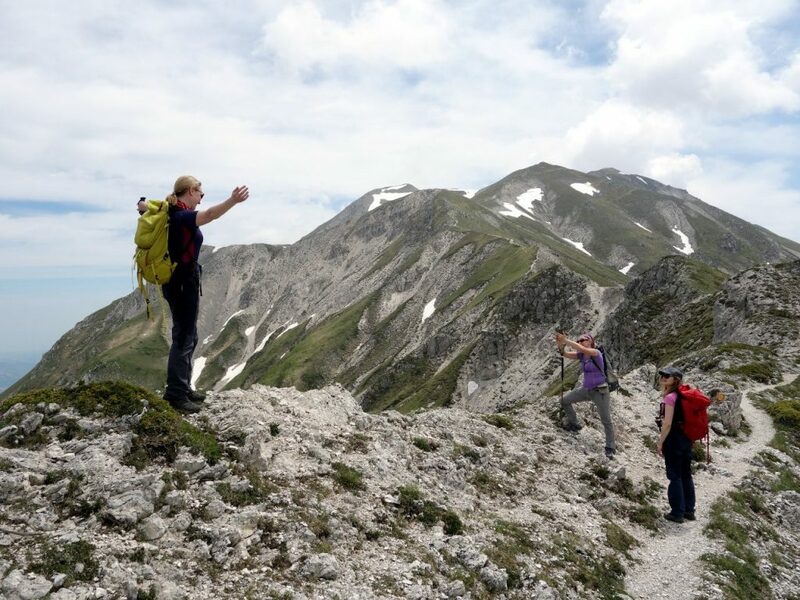 We had shown Jolanta and Bernadeta two very different peaks in two very different massifs a short distance apart. For them it was an unforgettable experience. In the space of the three weeks Edita and I had also completed most of the Cresta Orientale in two separate trips, but there is still a feast of peaks here for us to explore. ← An evening with Kenton Cool … Aha!